Twitter: everyone’s on it, but not everyone really knows how to use it. Let’s face it, mistakes are made all the time - it’s how we learn. But some mistakes are kind of outrageous, and well, downright embarrassing. Some mistakes in social media even have the very real potential to get your business trending - for all the wrong reasons. Social media marketing is about engaging with your customer, listening to their wants, and being able to really respond to your consumer as authentically as you can. It is not about pushing them your products, bombarding them with too much information, or ignoring them when they want to connect. In an article I recently wrote about How to Use Twitter to Drive Traffic to your Blog. It outlined 12 best practices on how to tweet to generate clicks and engagement. In this post, I will show you 8 worst practices on Twitter, and what common mistakes to avoid at all costs. Get your business trending on Twitter - for all the right reasons. Here are eight fixable methods of how not to tweet. Do you like it when Tweets are rife with product promotion? Neither do I. Yes, you’re on Twitter to market your business, but don’t send out tweets that just talk all about you. Social media marketing is about social engagement. It’s about dialogue you’re creating with your followers. Keep this at the forefront when you are posting your tweets. I have seen so many businesses not grasping this key shift in marketing. It’s particularly blatant with businesses (often small businesses, or those new to Twitter) who actually use hashtags like #buythisproduct. She is giving no incentive for engagement with her followers, and there is really no motivation for to click to her products on Etsy. These tweets still tell about the product, but they create engagement by being more personal and asking questions. I’ve seen large companies make these mistakes too. This may have worked in the days of push marketing and print advertising. But this is social marketing, and you need to shift into a more engaged communication with your customers. Businesses want more followers on Twitter for obvious reasons. The more genuine followers you have, the more your tweet messages are reaching out to your customers. But don’t be desperate! Begging for people to follow you is just, well, not cool. The tweet itself is not even from @CrazZyPaparaZz, who they want you to follow. If you really want more followers, post engaging content, take part in hashtag dialogues and generally show your business as one that a customer would want a relationship with. Give incentives for following you, by running contests and exclusive promotions on Twitter. Begging does not make you attractive, or frankly, trustworthy. It generally does not persuade the potential customer to follow you either. Believe it or not, a 140 character post on Twitter is actually too long. Studies such as those conducted by Buddy Media indicate that shorter tweets - those under 100 characters - get a much higher engagement rate. Additionally, when a tweet is too long, and takes up the entire 140 character count, there is no room for a retweet or an @mention to easily be shared by followers. Some of the most retweeted tweets have been under 6 words (the most iconic being Barack Obama’s 2012 election tweet “Four more years.”). You don’t need to fill your entire 140 character limit with words, hashtags and too many links. Keep your updates succinct, witty and to the point. Don’t neglect to check your @connects on your business Twitter handle. Twitter is a great platform to use for customer service. In fact, many of your customers are likely using Twitter, instead of email, to contact you these days. Lots of new business can be found on Twitter too, if you are in a B2B. I can’t tell you how many times I’ve gotten in touch with business partners when I’ve mentioned them in a tweet, and vice versa. Make sure you are checking your @connects throughout the day, and respond to people getting in touch with you this way. If you’re not, your business will look like it has poor service and that you’re just not listening to your clients. Don’t tweet out the exact same update all day long. I can’t stand it when a business spams me with the same tweet over and over again. This mistake is usually done by smaller businesses or marketers new to Twitter who still don’t quite get what tweeting is about. If your objective is to promote one marketing campaign, such as a contest or sale this week, make your tweets varied and interesting. Check out our entries so far…. bit.ly… Will you win? Get creative with your tweets to gain more engagement with your Followers. Retweeting is a cool practise for businesses to get in to. You can use it to give thanks to a great customer, or praise to a company you admire on Twitter. But don’t overuse it. 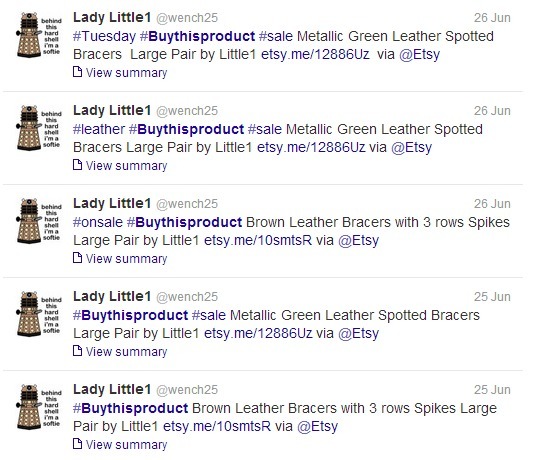 When you use a retweet tactic, keep it in line with your overall marketing strategies. Make sure the RT’s reflect your brand, and your tweeting habits. Don’t use retweets as a way to replace writing your own content. Using too many hashtags is a common mistake, particularly from newbies to Twitter. Too many hashtags make your update difficult to read. It also shows that you’re really not focusing your message to a few particular topics. In this example, I really don’t know what they are trying to sell. Are they a boutique or a wholesaler? The general rule of thumb is to include a maximum of three hashtags in a tweet. If you want to extend your reach to more hashtag topics, use them in separate updates. Do you hate this tweeting mistake as much I do? Do you check your Twitter feed only to find one business bombarding you with mindless spam about their company? I’m like you - and your customers - who stop following companies and people who tweet about themselves too frequently. I used to follow a ‘social media expert’ who liked to update his followers every ten minutes or so. He would post updates like “eating a japadog” and “How do you get rid of flies? They are all over my house!”. Needless to say, he’s no longer in my Twitter feed. Rapid tweeting is annoying. Generally speaking, businesses should be tweeting a maximum of eight tweets a day (and this depends on if you have a global market with various time changes or not). There’s no real rule about how often to tweet. Check your engagement rates (for retweets and @mentions) to gauge the pace for the most effective timing for your updates. And do not over tweet! Auto-tweeting is one of those practises that you can love or hate. If you use a social management system, and you pre-schedule your tweets - make sure you still monitor your account. Auto-tweeting has been the source for some of the most epic Twitter blunders. This is particularly true in cases of unforeseen incidents. An example of this that stands out most in my mind was from 2012. Live Nation was hosting a concert a Toronto, Canada. They were tweeting about the upcoming concert, and promoting how to buy tickets for it. Then a horrifically tragic accident happened. The roof of Radiohead’s stage collapsed. It was fatal. Live Nation’s pre-scheduled tweets were still streaming, promoting tickets for the now cancelled concert. It resulted in quite a PR nightmare for the company. This might be an extreme example, but the moral holds. If you do choose to auto-tweet, be aware of events related to your business. Here’s a mistake I see a lot in my social media community. (Sorry guys.) If you manage more than one Twitter account (even just your’s and your company’s), be very cognizant of what Twitter feed you are posting to! Accidentally posting your personal tweets to your business’ handle happens more often than you might think. For the most part, if you are tweeting fairly innocuous comments, and you have some quick wit, you can avoid a major PR disaster for your company…. Sometimes, however, you don’t. I first heard this about this story directly from Dave Olson, VP of Community at HootSuite. Dave is a much better storyteller than me, but I’ll try to do it justice. According to Dave, at HootSuite, this response not only got retweeted tons, but it also created an unforeseen happenstance. 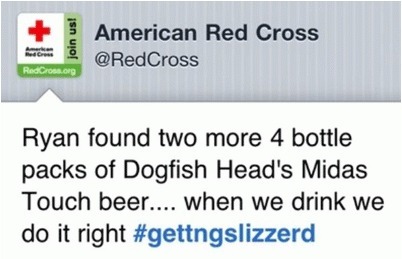 A pub in Australia apparently began tweeting about the Red Cross, offering easy donation options for their patrons. This created a short wave in a fundraising spike to the American Red Cross around the world. This story has a happy ending, but not all of these mix ups do. Be careful when you are managing more than one Twitter account! What do you think? Have you made any of these mistakes (that you care to admit)? How did you resolve them? Have you seen other less-than-great tweets on Twitter?